Categories: Adoption Parenting, Adoption Professional Basics, Adoption/Foster Care Counseling, Attachment Disorder, Child Care & Parenting, The Adoption Professional. 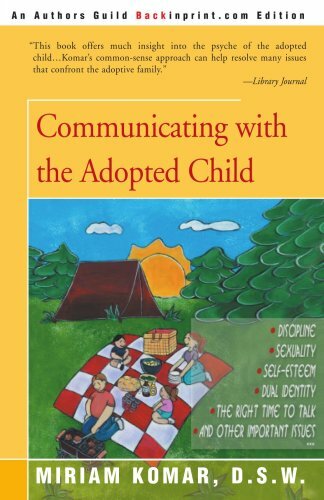 This book focuses on the importance of family conversation and the power of speech in providing both information and emotional support to the adopted child. Utilizing examples drawn from interview, case studies, and extensive correspondence, as well as from leading studies in the fields of psychology, sociology, and social work, Dr. Komars book give a reassuring perspective on some of the most troubling issues of adoption. Here is specific, proven advice on how to overcome common obstacles to parent-child communication.